What kind of tickets can Ticmate help me with? Whose name do I enter under Client Information? What do I do if I haven’t received my tickets? What are your fees like, and are they included in the ticket price? What does it mean when my tickets are on request? How do I book tickets for my group? Once I purchase tickets, can I change or cancel? Can I contact a real person for help? Can I select the exact seats that I wish to sit in in the theater? What is a "matinee performance"? How far in advance should I book my tickets? What are the best musicals on Broadway? Do the theaters have a dress code? What time should I arrive at the theater or venue? What do ‘Premium seats,’ ‘Standard seats,’ and ‘Best deals’ stand for? How do I find the best seats in the theater? Ticmate was founded in 2007 by Swedish ticketing entrepreneur Marcus Moeschlin who thought he could help make it easier for customers globally to buy tickets online in local language. We speak english and you pay in USD to some of the world’s greatest entertainment. Visit About Us for more information. Ticmate has offices in Berlin, Copenhagen, Stockholm and New York with product specialists on the ground and sourcing the latest must-do product every day. We make buying tickets easy and secure and only contract directly with the inventory owners and fully vetted authorized ticket providers. It is unlikely to find an instance where at least one member of staff hasn’t personally been to and experienced what it is we sell. Ticmate offers unparalleled online access to tickets to some of the world’s most popular attractions, convenient airport transfer services, money-saving sightseeing options and carefully curated fully guided tours, as well as tickets to highly sought after theater, shows, concerts, European football, and other sport, depending on the city. To view our complete list of entertainment. Our proprietary online system has been designed to offer you up-to-the-minute real-time access to an unrivalled selection of tickets, and all the information you will require to make the right purchasing decisions for your next trip. Product descriptions include everything you need to know about the event or service, and what to do on the day so that you don’t waste time worrying. Once tickets are purchased, a confirmation email containing your voucher or e-tickets is sent to the email address you supply. The confirmation email also acts as your receipt. All prices quoted and charged are in USD, even for international events, and charges will post as Ticmate on your credit card statement. Ticmate only contracts directly with the inventory owner or authorized ticket provider so you never need to worry about fraud. The name that should be entered the first name and surname fields in Step 2 of the booking process under Client Information is the first and last name that will print on the voucher or e-tickets, so please enter the first and last name of the one of the persons who will actually be using the tickets. If that is you, please enter your first and last name. If you are gifting tickets to a friend, please enter the friend’s first and last name. Please note, a photo ID matching this first and last name may be asked for at the event, so please do bear this in mind. Please refer to the product page of interest for further details. Each product page contains specific information regarding ticket collection. In some cases, a voucher is issued, in others, actual e-tickets are sent. Either way, the process is always simple, and as eco-friendly as possible. The confirmation email sent to you after tickets have been purchased, will contain the actual voucher or e-tickets. Both voucher and e-tickets will also contain all pertinent information so that you always know exactly what to do. Please contact customer service as soon as possible in the unlikely event that you have not received your confirmation email containing your voucher or e-tickets. Please note that we may not be able to refund unused tickets due to a claim that they were never received, so it is very important that we hear from you first and are given the opportunity to assist you. Prices displayed online include all costs, taxes and booking fees applicable to the distribution costs of the tickets. Our prices are always competitive or better than other sellers, including, in some cases, the primary inventory owner. In most cases, a booking fee of 10-25% is included in the price of a theatre ticket. Football tickets can include much higher fees depending on the match. As we hold our own ticket inventories, we sometimes have tickets available even when the primary inventory owner is sold out. Buying in advance through Ticmate means you are guaranteed a ticket – no lines, no sold outs, and no fraud. We do not offer student-specific discounts– but for sightseeing and guided tours there are often discounted tickets for children, and in some cases for seniors as well. If there are special rates available for children or seniors, you will see them after selecting a specific date for your product. Remember to double-check the age requirement when booking multiple products, as age requirements may vary by product. You will find the exact address and a map of the meeting point on the product page of the specific tour of interest– all our meeting points are centrally located and are generally very easy to reach by public transportation, taxi, car or by foot! The exact address will also be included on your voucher or e-ticket. Typically, all tickets purchased through Ticmate are automatically confirmed at time of payment. However, some special events require special handling to confirm directly with the venue or local agent. We refer to these orders as “on request”, and this exception, if it relates to the product you are interested in, will be clearly -mail noted on the product page. “On request” orders are typically responded to within 48 hours, though it may take longer over a weekend or holiday period. As soon as your order is confirmed by the venue/agent, we will automatically send the voucher or e-tickets to the email address supplied and finalize the payment. Should it not be possible to confirm your tickets, we will inform you via email, and release the amount previously held on your credit card. Please continue to add enough tickets to your shopping cart until your group requirement is met – for example adding 8+6 tickets for a group of 14 people, 8+8+8 for 24 tickets and so on. Our system will allocate the best tickets as close together as possible without sacrificing seat quality. We do not offer group discounts. Please take a few moments to read our terms and conditions here (they are not that long! ), (they are not that long! ), especially when it comes to requests for any changes or cancellations. In general, our contracts with our suppliers do not allow for any changes or cancellations, but we are always happy to help when permitted. Please also note that Cancellation Protection against injury and illness preventing travel can be purchased at time of ticket purchase. Please refer to full Terms & Conditions for full details. Kindly note that cancellation fees may still apply. Please contact Customer Service for further assistance if required. Yes, you can add cancellation protection to any ticket order at the time of booking. (You are not allowed to add the protection afterward). The protection provides full coverage on that specific order should you have any accident or if you, or a member of your travelling party or any of your closest relatives fall ill. Kindly note that a medical certificate is required in order to make a claim. You will find complete details about the cancellation protection in your shopping cart and in our full Terms & Conditions. Of course! Please contact us at helpdesk@ticmate.com, or by phone at 1-800-325-1964. Please note that order confirmation emails are issued from a “no-reply” email address. Our US office hours are from 9:00 AM to 5:00 PM EST Monday thru Friday. Urgent after-hour emails are responded to promptly. You won't be able to choose the exact seats, but you will be able to choose the category of seats, and you will be assigned the very best seats available within the selected category. You will receive an updated voucher with exact seat locations within 36 hrs of purchasing tickets online. A matinee is a performance that takes place in early afternoon, but some theaters have a late matinee around 5 p.m. Most theaters have a mid-week matinee and one on Saturdays or Sundays. New York City is arguably one of the greatest cities in the world, and many Broadway shows sell out, especially on busy Friday and Saturday performances and across summer and other school holidays. To avoid disappointment and get great seats to the show or shows that you want to see most, we recommend that you secure your tickets as soon as you have booked your flight to New York City. 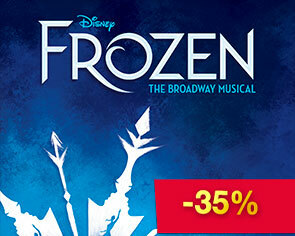 ​You can view the top musicals by clicking on front page or on the musical tab. None of the theaters have a strict dress code. Elegant or casual dress are acceptable unless other otherwise stipulated. We recommend you arrive at the theater 30 minutes prior to curtain. Most theaters have a bar should you wish to have a drink beforehand. Programmes and souvenirs are available for purchase in the theater. ‘Premium seats’ are the best seats in the theater. If you choose ‘Standard seats’ you’ll be given the best available seats in the section (e.g. Orchestra or Mezzanine). The ‘Best deals’ give you a chance to get good seats at a discounted price. ‘Premium tickets’ are always the very best seats in the theater.